Hey guys, I know it has been a while you heard from me, I was actually away due to some reasons. But here’s the best part (I’m back and I’m better). So, it’s basically going to be fun all the way. I must say. I missed being here. Okay, time to get down to business. Don’t be scared, I won’t bore you with long talk. Today’s post is basically going to show you how to create a poll on Facebook. Let me rephrase this. 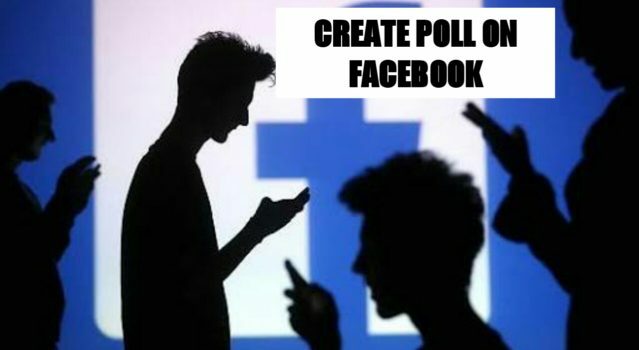 I will teach you how to create a poll on your Facebook timeline using your Facebook App on your Android device. If you don’t know what a poll is, I’ll tell you. A poll could be a survey to get information on what most people think about something or it could be a voting activity. You know, where you have Mr A, Mr B and C, whoever has the highest votes wins. That’s a poll. So, let’s say you are thinking of running a competition on Facebook, you could create a poll on your timeline for people to vote for the winner, that’s not all. Let’s say you are confused and don’t know if you should go for the iphone X or Samsung s9. A poll could be a way of getting people’s preference between the two. I am just giving you some samples so you know how useful a poll can be on Facebook. So, now that you have gotten the hang it, it’s time to show you how to create a poll on Facebook timeline. 1. Open the Facebook App on your Android device. 2. Click on What’s on your mind. 3. Scroll down and click on Poll. 5. Set poll Expiration time. (When the poll will End). 6. Click or tap on share to make poll visible. To spice up your Facebook poll, you can decide to Tag people to your poll, Add an activity, sticker or feeling, you can also tag an event or check in your present location. All these are basically going to spice up your poll and make it more compelling and attractive. Thanks for reading this article on how to create a poll on Facebook timeline. Why not spread the word and share this article to your friends and family by using our share buttons below. Q: Is there a limit to the number of polls I can create in a day? A: There is no limit to the number of Facebook posts you can make in a day. A poll is just like a post. I don’t think there is a limit. Q: How do I view my poll results? A: After the poll has ended you should be able to see the results of your created poll.